The Council is seeking your views on its proposal to redesign and improve the Mental Health Supported Accommodation Pathway in line with our current approach to prevention and early intervention. What is the Accommodation Pathway? The Mental Health Supported Accommodation Pathway provides services for those people who would not be able to live on their own immediately after being discharged from hospital. 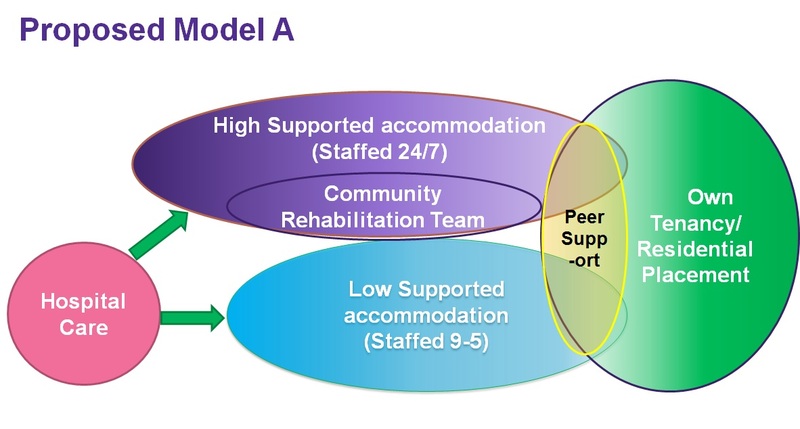 Though recovery outcomes are good, movement through to more independent accommodation is very variable. Move-on varies across projects, with only a few providers achieving the 30 per cent target. Evidence suggests there is less demand for low support provision. In addition to this, the needs of several residents, currently in the pathway, would be better met in a different setting (e.g. sheltered accommodation, nursing care). The current pathway is depicted in the diagram below. There are 231 places in four different levels of supported living from hospital into tenancies or residential placements. This means that residents who are placed in intensive support after a stay in hospital will most likely have to move accommodation four times in a short period of time before they finally settle in their own accommodation. Changes being proposed to the accommodation pathway? We have been discussing the possible redesign to the pathway with service providers since summer 2018. In addition to discussions at regular meetings with service providers, we have met with 18 residents and 47 staff members at various supported accommodation projects to discuss details of the model. Feedback and comments from these meetings have been incorporated in Proposed Model A. 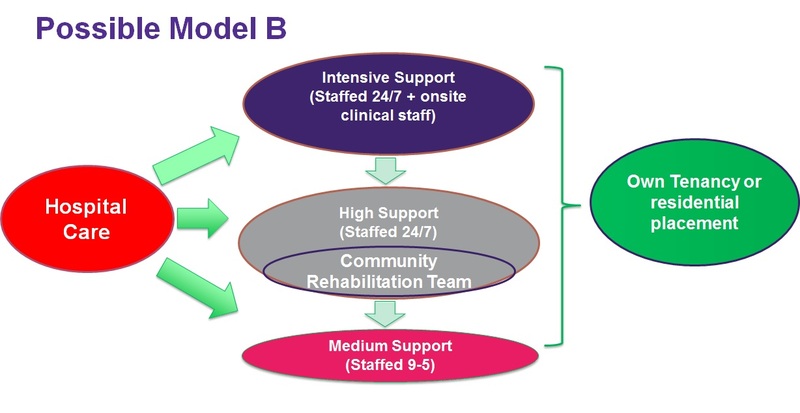 The most significant change in this model is a reduction in the number of levels in the pathway from four to two, which will ensure that residents don’t have to move from one project to another as they get better. 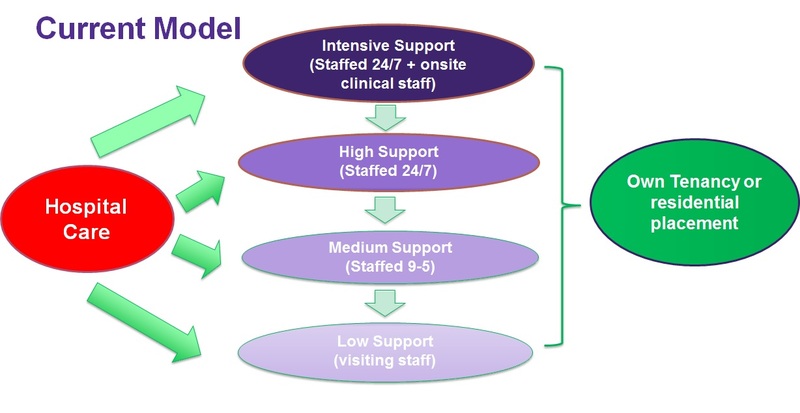 The proposed pathway will consist of two levels: high support, with staff available around the clock; and low support with staff available 9 am to 5 pm, Monday to Friday (as well as weekends, if needed). The service redesign will also include a reduction in the number of places in the pathway by approximately 12 per cent. This is in recognition of the fact that some of the residents currently in the pathway need some form of alternative service, such as residential or nursing care. Some of the savings associated with the reduction in projects will be used to develop a peer support service that will support residents through transition from supported accommodation to more independent living. Another possible change would be to stop commissioning Low Support Services, which would reduce the number of places in the pathway by 30 (12%). We would increase our offer of floating support, which will mean that when a resident is discharged from the pathway into their own home, they will have support to maintain their tenancy and prevent them from relapse. Residents in the pathway would also benefit from services provided by the Community Rehab Team. The third option would be, not to make any changes at all and to contract the services in the Mental Health Supported Accommodation Pathway in exactly the same way as we have been doing so in the past. Download the complete consultation document here. Camden Council are consulting with residents and providers to seek your views on potential changes to the mental health accommodation pathway in the borough. This consultation will run from 25th January to midnight 10th March 2019. You must be a Camden resident aged over 18 years to respond or be a provider of supported living services in the borough. If you would like this consultation document in an alternative format please contact morelda.nanton@camden.gov.uk. proposed model and the timetable for key decisions. Paper copies of the consultation information and response form will also be available.